Daily Menu from Almo Nature comes in a range of delicious, digestible flavours. It is produced in a gentle way, using the high-quality ingredients in their own stock to preserve natural flavour and valuable nutrients and proteins. This also means that no chemical additives such as colours or preservatives are used. The vitamins included in this recipe round off this food, giving it a fabulous nutritional profile that meets all of your cat's needs. This balanced Almo Nature Daily Menu food is the ideal way to keep your cat happy, healthy and active. Almo Nature Daily Menu 170g at a glance: Supplementary wet cat food With high-quality, nutritious ingredients of premium pet food quality In a range of fabulous flavour varieties in MouΒe or Chunks Cooked in its own stock: this natural method preserves nutrients, as well as giving fabulous flavour and digestibility Beneficial nutrient mix: with valuable proteins, vitamins and minerals With taurine: to support heart, nerves and eyesight Natural: sugar-free, as well as free from artificial additives such as colours, attractants and preservatives An every day luxury: for a well-rounded supply of nutrients Almo Nature Daily Menu comes in a practical ring-pull can for the clean and simple division of portions. Daily Menu in the 170g can is an especially great value variety of Almo Nature, so you can offer your cat quality food and still save a little money with a larger size can. Please note: Almo Nature is natural and unproceΒed and every single flavour variety of Almo Nature Daily Menu (tuna, chicken, etc.) contains natural vitamins and minerals (e.g. calcium, phosphorous). 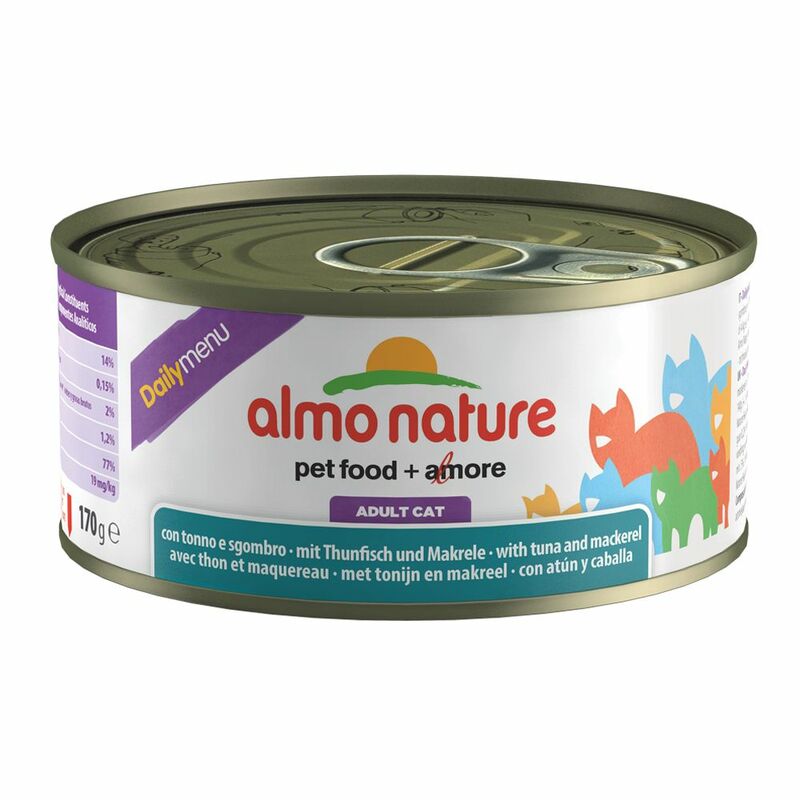 Almo Nature therefore proposes a diet based on a variety of different natural ingredients (red meat, poultry, fish, dry and wet food), offering your cat a healthy, balanced diet. Almo Nature Daily Menu is a supplementary cat food.